NEWNHAM: A ROMAN BATH HOUSE AND ESTATE CENTRE EAST OF BEDFORD. EAST ANGLIAN ARCHAEOLOGY, VOLUME 158. By David Ingham, Jeremy Oetgen & Anna Slowikowski. 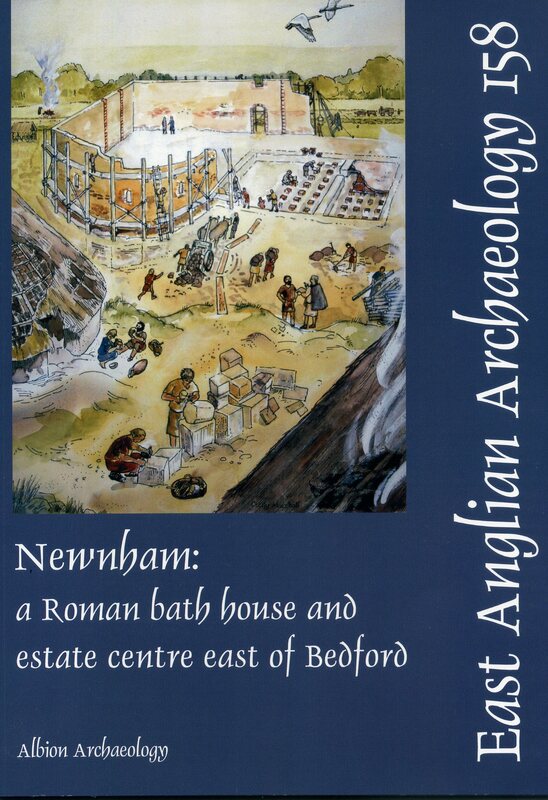 An excellent, though much belated, account of the excavations undertaken between 1972 and 1975 at the site of an elaborate Roman farmstead at Newnham. Nearly all the Roman remains have now been destroyed by gravel extraction. The farmstead probably originated in the C1AD, just before the Roman conquest, and was initially fairly typical of contemporary rural settlements in the Great Ouse Valley. The settlement was characterised by ditched enclosures, some used for livestock management, with a mixture of roundhouses and simple rectangular buildings. By the end of C2AD, however, the site had at least one substantial rectangular building with stone foundations, suggesting a degree of ‘Romanisation’ not normally seen on farmsteads in the Bedford area. In the C3AD an even more elaborate stone-founded building was constructed, which comprised a range of rooms with underfloor heating. Three of the hypocaust rooms are thought to have comprised a bath suite. Some of the finds suggest that the site had a higher status than that of other farmsteads in the area. There was a good representation of fine-ware pottery and continental imports, while ceramic building materials and painted wall plaster indicate a degree of prosperity, although not on the scale of many villa sites elsewhere. The general absence of other high status indicators and paucity of monetary finds suggest a largely unmonetised economy, at least prior to C4AD. The authors conclude that the Newnham site should not be classed as a classic ‘villa’. Instead it is suggested that it represents a large organised farm, focused on livestock production (cattle and sheep), which culminated in the C4AD in a commercial butchery operation to supply lamb and wool to other settlements. The ruined Roman settlement was subsequently a site of early Anglo-Saxon settlement, but activity had ceased at the end of the C6AD. A well-illustrated and interesting report, particularly when read in conjunction with the Bedfordshire Archaeology reports on the more recent excavations at Box End Kempston, Bedford Academy and Manton Lane. Recommended.